Winner last year in Las Vegas at the United States Open but no similar success on the ITTF World Tour, Japan’s Taimu Arinobu caused the major upset on the opening day of play, Tuesday 24th July, in the Geelong Arena at the Seamaster 2018 ITTF World Tour Platinum, Australian Open. Furthermore, he became the first player to reserve his place in the main draw. Standing at no.605 on the current Men’s World Rankings, after accounting for New Zealand’s Dean Shu, listed at no.200 (10-12, 11-3, 11-9, 11-4, 14-12), he concluded his group phase matches by causing a major upset. He beat Portugal’s Tiago Apolonia, named at no.40 in the present day global order in six games (11-8, 11-7, 5-11, 5-11, 11-8, 11-8). The defeat means the end of the road for Tiago Apolonia. Players finishing in first position in groups number one to ten advance to the main draw, those who secure top spot in group numbered 11 to 22 must compete in a preliminary round. No room for error; in the quest for top place in the group there is one most intriguing contests that awaits. 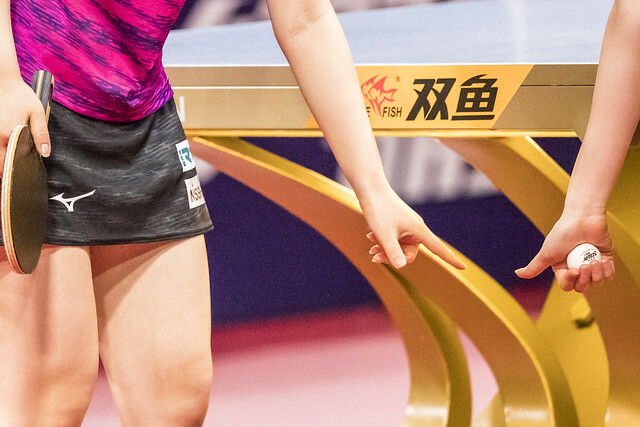 Korea Republic’s Jang Woojin, who carried all before him at the recently concluded Seamaster 2018 ITTF World Tour Platinum Shinhan Korea Open, meets China’s Yu Ziyang in the decisive contest. Both former World Junior champions, Jang Woojin in Rabat in 2013, Yu Ziyang the following year in Shanghai, each accounted for 15 year old Cho Daeseong. Jang Woojin overcame for his compatriot in five games (11-7, 11-8, 11-4, 7-11, 11-6), Yu Ziyang needed the full seven, having to recover from a two games to nil deficit (7-11, 9-11, 11-5, 11-5, 11-7, 9-11, 11-7). Disappointment for Tiago Apolonia, success for Jang Woojin; for the other leading names it was an opening day without alarm. Japan’s Maharu Yoshimura beat India’s Manav Vikash Thakkar (11-2, 11-6, 11-4, 11-4); Chinese Taipei’s Chen Chien-An overcame Chinese Taipei’s Lee Chia-Sheng (11-6, 11-5, 11-3, 11-4). Likewise, Korea Republic’s Jeoung Youngsik, the winner in 2015 when the tournament was staged in Tweed Heads, started his quest for honours by beating New Zealand’s Victor Ma (11-4, 11-2, 11-7, 11-9). Similarly, Germany’s Benedikt Duda overcame Belgium’s Florian Cnudde (11-7, 11-3, 12-10, 11-8); India’s Sathiyan Gnanasekaran prevailed against Australia’s Zhang Shaoping (11-4, 11-2, 11-4, 11-4). Notable performances from visitors to Australian shores; notably the host nation player to catch the eye was Kane Townsend; in the same group as Chen Chien-An, likewise he beat Lee Chia-Sheng (11-9, 6-11, 12-10, 11-5, 11-8). Play in the qualification tournament concludes on Wednesday 25th July.